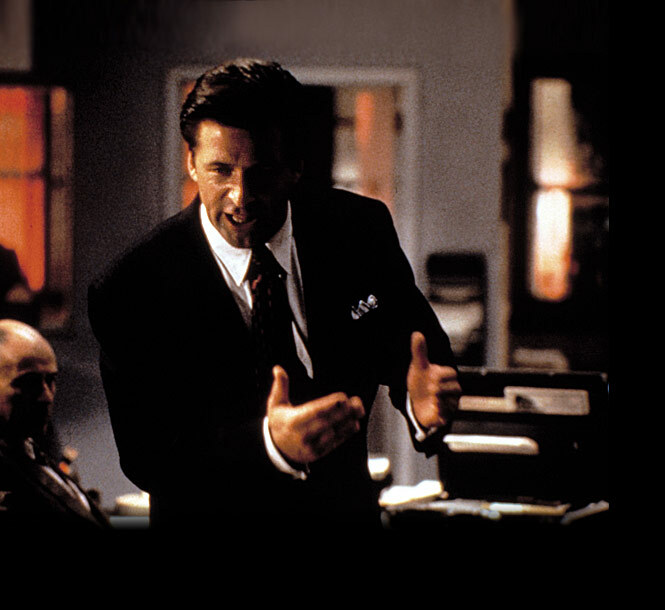 David Mamet sends an ironic message with Glengarry Glen Ross that dishonesty and corruption become methods of surviving in the competitive world of men. His nineteen-nineties, post-modern representation of the crisis of masculinity glimpses into the lives of pressure-stricken salesmen when a system of capitalism forces them into fighting for job security. These conditions place the characters in a moral conundrum whereby they seek alpha-male prominence through material gains or fail by default of not meeting the sales standards of Mitch and Murray. Mamet, with the direction of James Foley and cinematography of Juan Ruiz Anchia, treats the film like his stage play by keeping the characters in a contained, fishbowl-like habitat so that the incessant rain, passing of the L train, and lingering presence of a detective in the merciless real-estate office isolates tensions between characters. Through an oppressive environment and performance styles of an all-male cast, Mamet situates the characters of Glengarry Glen Ross on scale of failure and success in a cutthroat, corporate workplace driven by masculinity. The implication that an order of free enterprise subordinates everyone in the office, including John Williamson, creates a male workplace under the notion of nothing being good enough. The winners keep their jobs and win a car or a set of knives (figure 5). The underachievers lose their livelihood, stripping them of their male pride. No options exist in between. This male-driven environment of the film presents itself through few, minimalist sets. Mamet contains the dialogue-driven actions and restlessness of the film in an atmosphere that maintains, as Vincent Canby mentions in his New York Times review, “… the claustrophobic nature of the original stage work,” (Canby, par. 5). This claustrophobia intensifies pressures of cutthroat mentalities as a pro-capitalist business creates the film. The enclosed environment also makes the world beyond feel empty, like the salesmen make pitches in a rainy, desolate world that predestines their failure. A sense of entrapment permeates throughout the film when the salesmen, whose jobs rely on communication, cannot communicate with each other. Though in the business of selling, they have literal barriers between each other. With Geroge Aaronow and Dave Moss, respectively, in the middle of the scale of failure to success, Alan Arkin’s portrayal of Aaronow creates a character whose natural pace feels slower than the other characters. He talks slower and repeats back what he hears as a question. Where he exhibits passivity, getting nowhere because he does nothing except talk, Moss displays aggression without caring about consequences, like stealing leads from the office. In playing off the environment of the film, Moss makes Aaronow, the weaker of the two, feel trapped as an accessory to his schemes. Shelley Levene, with the nickname “Machine” which sounds old and outdated, and James Lingk, respectively the weakest characters in the scale of failure and success, find their manhood reduced to motivations revolving around women. Levene thrusts himself into various immoral methods of conducting business for the sake of his sick daughter while Lingk backs out of his deal with Ricky Roma because of his wife’s disapproval. Levene’s determination for helping his sick daughter, a less self-serving need than wanting a car like Roma, pushes him to desperation. With the subtle reminder of a woman’s photo on his desk, the downfall of Levene prompts the audience in viewing failure as the ultimate death to masculinity, since he goes to the extreme of stealing for a female, in the corporate world. Al Pacino’s performance as Ricky Roma, the most successful salesman in the office, makes the material prize, a Cadillac, his main concern throughout the film. His self-reliance makes him stronger, someone who excuses himself from the detective’s accusations of robbery and Blake’s condescending speech—where Baldwin emphasizes on the chalkboard a sales acronym that the working men see every day on a poster behind him. Through Pacino’s sweet-talking, confident acting style, Mamet points out the fault in the mentality of the characters needing “brass balls” when Roma uses femininity in order for making his client feel masculine and in control. Roma uses femininity to his advantage, pitching to Lingk as if they sit together on a date, letting Lingk be the man with his arm across the booth as Roma seduces him into a sale with charisma. 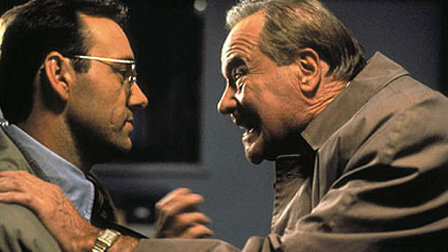 Pacino plays his character like a parent in control of their rage, as if saying, “I am not mad at you, but I am disappointed,” while Spacey portrays Williamson, for the only time in the film, with a childish look of shame, especially at the sound “fairy” as an insult that correlates femininity with weakness. This moment of noticeable concern on the usually stoic Williamson’s face allow for a realization that though Williamson makes the decisions in the office, outside his comfortable authority exists a chain of command in the corporate world that terrifies him. The unseen men of the film, like Lemkin, make even Williamson feel subordinate. Here, he becomes on par with the salesmen as another fish in their bowl, under scrutiny of the capitalist system’s hierarchy that traps them. The notion of not being masculine becomes evident not just in femininity, but also in the childishness that Roma detests Williamson for, which Levene exemplifies when Lemmon’s fast-talking pace for wordiness puts viewers on edge for a moment where he might, and ultimately does, open his mouth too soon. Likewise, in an unsuccessful pitch, viewers make the connection of childishness and Levene weakening himself when he sits on a couch where toys scatter around him. Lemmon even gives himself a moment where he holds the teddy bear before placing it beside him. Levene, the character who tips his scale toward failure more than anyone else, encompasses both feminine motives and childishness. Even though Levene holds the literal fishhook, Lemmon’s character makes the least masculine of sales pitches here. By contrast, Pacino’s Roma, who sits at bars with his smooth-talking manipulation that pries on insecurities, becomes the only salesman capable of figuratively reeling in his clients as bait. 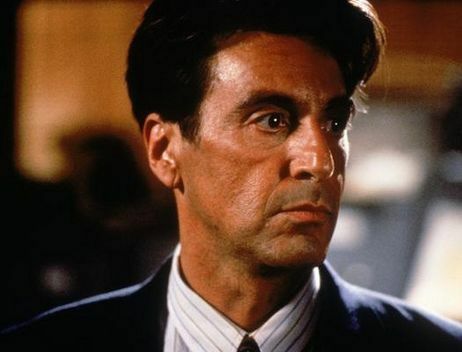 Pacino’s acting centers on paying attention to people. He looks them in the eyes and tells them the stories they want, but Lemmon’s character spends more time convincing himself, not making direct eye contact and switching his sales tactics in an unnerving way that gets him sent out in the rain, without an umbrella of his own, on numerous occasions. Lemmon changes his personality and his facial expressions within brief moments based on the parts he plays for scheming, but because he seems so inauthentic, he fails at it, unlike Pacino who uses manipulation in a charming way. Ultimately, because his talk does not redeem him, Lemmon grabs for Kevin Spacey, resorting to physical force in reclaiming dominance and masculinity in the desperate situation. From this dread of extinction and falling into a crisis of masculinity, the actors place their defeatism into well-timed reaction shots. Here, each tearful eye glints with the unhappiness of shattering hopes. 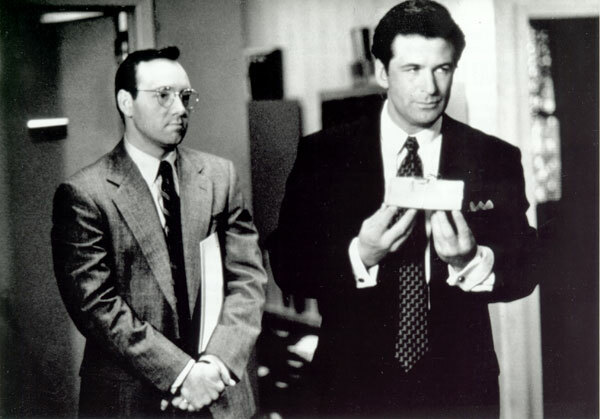 The salesmen in Mamet’s 1992 film exude disparity under the pressures of capitalist business promoting superiority in the workplace as a form of masculine success. Mamet’s ironic message makes the male-run system of capitalism, seen by the salesman as opportune for achieving their greater destiny, destroy them when unscrupulous tactics become their downfall. The competition between the characters that drives them to lying, scheming, and stealing leads them into turning on each other for a chance at getting ahead, commenting on world operating under a rigged game where nobody wins except the system itself. Canby, Vincent. 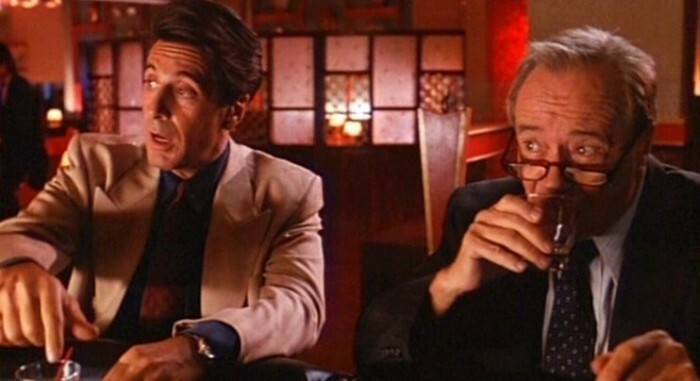 “Glengarry Glen Ross (1992) Review/Film; Mamet’s Real Estate Sharks and Their Prey.” Rev. of Movie. The New York Times 30 Sept. 1992: n. pag. The New York Times. The New York Times Company. Web. 15 Nov. 2013. The Full Monty. Dir. Peter Cattaneo. Screenplay by Simon Beaufoy. Perf. Robert Carlyle, Tom Wilkinson, and Mark Addy. Fox Searchlight Pictures, 1997. DVD. 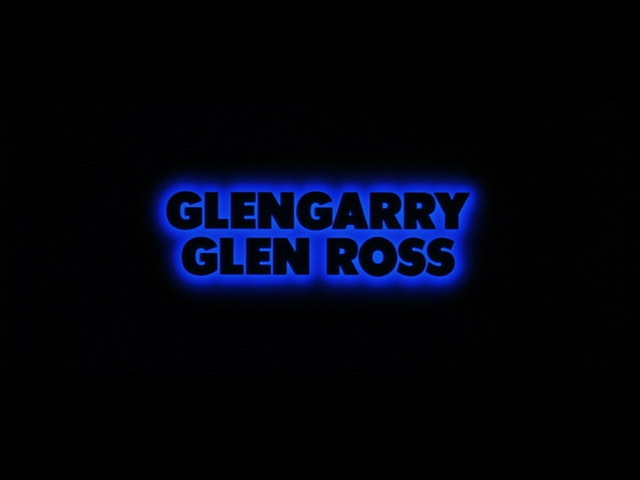 Glengarry Glen Ross. Dir. James Foley. By David Mamet. Perf. Alec Baldwin, Jack Lemmon, Al Pacino, Ed Harris, Kevin Spacey, and Alan Arkin. New Line Cinema, 1992. DVD. Slack, Niel Graham. “A Cinema of White Masculine Crisis: Race and Gender in Contemporary British Film.” University of Sussex (2008): 74-75. Sussex Research Online. Web. 15 Nov. 2013. In Ethan and Joel Coen’s 1991 comedic noir film Barton Fink, a symbolic prologue to the decade’s later films such as Quentin Tarantino’s Pulp Fiction and David Fincher’s Seven, the titular character undergoes a manic, mental deterioration. This visual depiction of an inner descent exemplifies itself in many outward aspects of the filmmaker’s cinematic approaches that include setting, characters, and cinematography. One specific sequence with such parallels involves Barton’s arrival into the world of a ramshackle hotel. In this particular sequence, The Coen brothers and cinematographer Roger Deakins, through methods that include disorderly production design, fluid camera movements, and elements of German Expressionism depict unsettling characters and represent Barton Fink’s entrance into the Hotel Earle as his hellish descent into psychological instability. The transitioning shot of waves striking a rock on a beach overlaps with Barton’s entrance into the eerily uninhabited Hotel Earle. Similar to German Expressionism films, this wave-crashing imagery shows submergence, like a sense of drowning, into a world of madness that quickly overcomes Barton’s mind. This brief overlap into Barton’s unsettling new dwellings starkly contrasts with the high culture, elegant atmosphere of the scene before. In that earlier scene, where Barton expresses his concern for the “common man,” the colors gleam and the lights shine brightly. This provides a sense of warmth in a room full of inhabitants, unlike the bleak and lifeless lodgings of the Earle, but this vibrant coloration soon washes away, turning into the insipid, muted hues of the Hotel Earle where the world of commercial Hollywood ceases. The mise-en-scène of the Hotel Earle, the everyman’s abode, creates visual frustration and discomfort along with an intolerable air of mugginess. Fans scattered throughout the entrance imply an incessant heat that places anxiety on the audience’s perception of this foreign environment. This heat, along with slow and fluid camera movements, creates tensions. The characters in the hotel dress inappropriately for such atmospheric conditions as well, wearing multiple layers and faded uniforms. These elements create the impression of unbearable uneasiness within the menacing realm that welcomes Barton Fink. The composition of shots within this sequence also shows many objects placed slightly off center, such as wilting plants not aligned with the staircases in the background. Deakins’ cinematography frames Barton Fink between these spiraling staircases that split in two as well as merge together, highlighting the division in Barton’s mind that both dissociates and blends his sense of reality and imagination. This method stresses a subtle implication over Barton’s psychological condition in a way that echoes German Expressionism. The framing and surroundings thus intensify Barton’s mental state. This unpleasant aesthetic also appears in forms of clutter. Innumerable unmatched lamps, plants, and furniture clash like in a Sartrean idea of hell where torture comes from a disordered setting. The camera, in a wide, high-angle shot, moves upward as Barton enters as if watching him descending into damnation. These wide shots, suggesting more disarray beyond their sizeable frames, enhance the overwhelming anxiety that Barton Fink feels, by taking up the role of the common man, in a way similar to Italian Neorealist films. This overwhelming notion creates a world indifferent to his character. It is a world that consumes him. He has no control, especially after establishing himself as a resident in this place by contracting a living arrangement with the character of Chet. 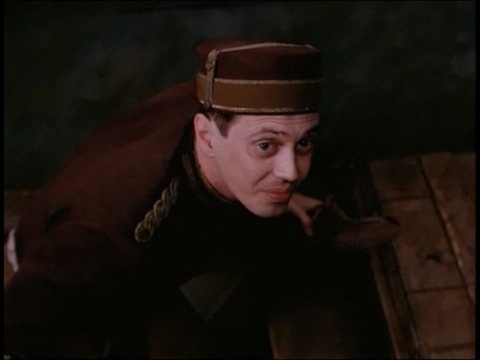 The Coen brothers introduce Steve Buscemi’s character of Chet, the jovial bellhop, with a similarly hellish implication. Chet, seen through a high angle, emerges from below in an entryway unusual to a conventional check-in greeting. This surreal entrance exemplifies Chet as a specimen, reminiscent to Jean Paul Sartre’s Valet in No Exit, of the underworld the hotel represents. In this Sartrean fashion, Chet ushers Barton to his personal hell with an automated quality that enhances the darkly comedic aspect of Barton Fink. Chet, in his overly friendly, painfully accommodating, and robotic manner, proclaims himself with an exclamation yet raises more questions about the phantasmagorical atmosphere of the Hotel Earle. For instance, when Chet asks for Barton’s signature, he spins the intimidatingly large book toward Barton before the overhead shot spins the camera in the opposite direction, expressing Barton’s spiral into madness as he signs away his soul. After, the camera moves in a jarring, quick unison with Barton, as if realizing the implications of this contract. The rapidity of this camera maneuver, and one following it where Chet bids Barton farewell, stands out from the unhurried movement of the preceding shots. Here, there is more of a shock in the concrete, ink-to-paper selling of Barton’s soul to the oddly animate hotel. In the next moments, the elevator operator represents a ferryman, like Charon from Greek mythology, who guides Barton into his Hadean accommodations six floors up. The presence of this elevator operator guiding souls to the sixth floor echoes the notion that the hotel is hell, entrapping Barton within its barriers. The elevator partitions imprison Barton while keeping the viewers outside the compartment, looking in on Barton. Deakins’ slow, dolly move into the elevator before Barton tells the operator his destination inches toward the figurative portal before shutting viewers out at the last minute, implying a forbidden world behind those cage-elevator gates of hell. 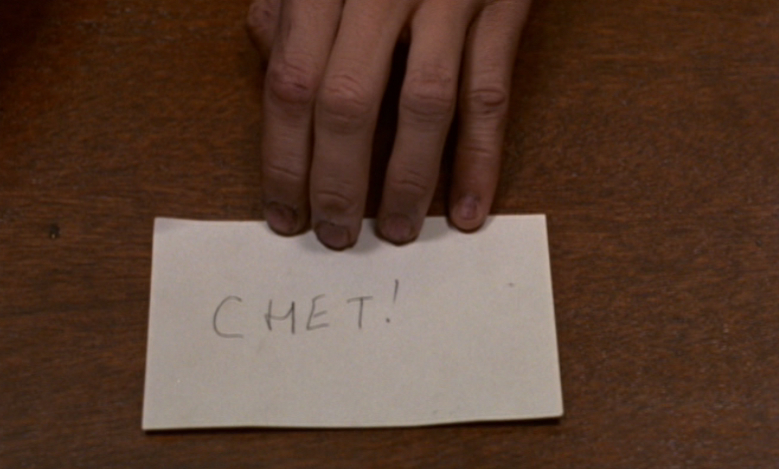 With Chet and the elevator operator as devilish agents, transitioning cinematography, and the Hotel Earle as an earthly depiction of hell, the Coen brothers and Roger Deakins carefully construct camerawork and visually suggestive set designs for illustrating these concepts as Barton Fink tries bringing himself near the “common man” by checking into the ominous, low-culture hotel. From this moment onward, interpretations to the questions regarding where Barton’s world shifts from real to surreal and what truly happens in his mind grow increasingly blurred. Deakins varies the pacing of his camerawork in relation to Barton’s psychology while the Coen brothers paint a surreal picture around their main character so that Barton’s inner struggles run parallel to the external factors affecting him. The rest of the film’s sequences show how the confined setting punctures Barton’s fragile psyche and ultimately escalates into a literal inferno by the climax.